BRABUS Weber is a high-performance aftermarket tuning company which specializes in Mercedes-Benz, Smart and Maybach vehicles, similar to Hamann which modifies Ferraris and BMW. Founded in 1977 by Bodo Buschmann, Brabus has since become the largest Mercedes tuner other than the DaimlerChrysler affiliate Mercedes-AMG. The company is based in Bottrop, near Düsseldorf, Germany. The English franchisee was, until recently, owned by Baron Martin Stillman von Brabus, an early lover of Margaret, Duchess of Argyll. Its competitors include Lorinser, Carlsson, Kleemann, and RENNtech. 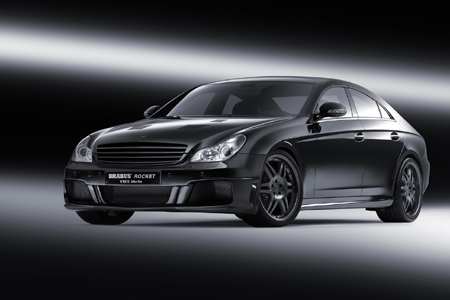 Brabus's primary focus is to achieve maximum engine performance through the increase of both horsepower and torque. Customers can either buy cars straight from Brabus or send in their Mercedes to be customized and/or overhauled. If a customer orders a car from Brabus, Brabus buys the particular car from Mercedes and then modifies it in-house according to the customer's requests. Brabus actually has no price list for its upgrades since the modifications vary so much, but realistically anyone who needs to ask probably cannot afford the level of upgrades provided. Brabus offers simple upgrades such as low profile spoilers, bodykits, carbon fiber splitters, and multi-piece alloy wheels. More serious upgrades include racing LSD's, open racig exhaust systems, twelve-piston disc brakes, and engine remapping. However, most customers pay for complete engine overhauls that Brabus has become famous for. The company typically orders crate engines from AMG and completely redesigns them to the level where Brabus is now officially considered its own auto manufacturer as opposed to a tuning company. Brabus engines range from small 200 horsepower K4 blocks for SLK roadsters and CLK-Class to 730 horsepower twin-turbo blocks for the CL-Class, CLS-Class, and S-Class. The company also provides improvements to the interior from custom upholstery, gauges, shiftknobs, pedals, and trim to various electronics such as wider LCD screens for the Maybach.